First, he was with the DMMC Institute of Health Sciences for a year as Chief Accountant. At the school, he was primarily responsible for controlling and managing financial affairs in the absence of the CEO/Owner. Next, in a crossroads of the sort that many Filipinos encounter across the nation, Julius availed of an opportunity to work for a construction company in Qatar as an OFW. It was an experience that Julius says was ultimately unforgettable – but for all the wrong reasons! So, he left the company and went back home to the Philippines. God does indeed watch over the righteous, however. As fate would have it, Julius would find himself right back at Petron. 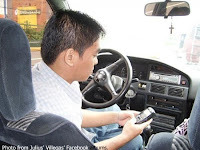 Presently, Julius is full-time Business Planning Analyst of Petron. His department reports directly to the company’s Chief Financial Officer. He is part of a team that regularly issues financial forecasts and handles corporate and capital budgeting. Julius is happy at Petron. He says that the company is an excellent employer and that is why he had no qualms about rejoining it when the opportunity arose. The second time around, he has been given the chance to prove himself; and he considers his work for Petron Malaysia particularly satisfying professionally. Away from work, Julius is very much the family man. He is married to the former Anabelle Mendoza, who he met in Makati on his way to the Petron Office. “She is a very loving and supportive wife,” he says of his better half. The couple has four children. Julianne Rayne, the eldest, is 10. Jan Raynier and Jana Rayne are 9- and 8-years old, respectively. 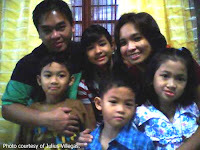 Juan Miguel, the youngest, is seven. When he gets free time, Julius says that his family is always the first priority. In fact, he makes the sacrifice of commuting from Tanauan to Ortigas everyday just so he can enjoy meals with his wife and kids. Apart from this, Julius says that his ultimate goal in life is to secure his family’s future. For his kids, he wants them to have the best education because he thinks education is the best legacy that parents can give their children. For Julius, there is also the occasional movie to enjoy. He is a fan of the historical genre and enjoys movies such as Braveheart; hardly surprising because the Mel Gibson classic was the big hit at around the time that he was graduating from high school. He also loves the World War II documentaries that they run on NGC and the Discovery Channel every now and again. Quality does indeed shine through, in the end; and I for one, will be interested to know what he makes of himself. Being a CPA board topnotcher, after all, does not just sort of happen. Julius has had a colourful career; and the road has had its twists and turns. In the end, every crossroads ultimately turns out to be just part of the learning curve.